Another quick post today as I need to get ready for church. As I said yesterday, I decided to reward myself for the three-book contract I just signed with some stamp sets I've loved for a long time, and the flower set I used on this card is the prime example. It's called Painted Flowers from Altenew. I'm crazy in love with this set...and the four others I purchased which will be coming to you soon. The other products used on this card are from CTMH (Me & You, punched pattern paper, Fern Thick Twine), Fiskars (scallop border punch), Pretty Pink Posh (sequins), and Washi Tape and doily from somewhere like Hobby Lobby. Okay...gotta run. I only have half an hour to get pretty before church. I checked my mail three times today waiting on packages from My Favorite Things and Altenew. I decided to reward myself for the three-book contract I just signed with some stamps and supplies I've been coveting eyeing for a long time. This card uses The Whole Herd from MFT on a Retro Sketches challenge, but I was too late to link up, so I'm adding it to Curtain Call's Simplicity challenge. The paper is long-gone from CTMH, and the Baker's Twine was purchased at Hobby Lobby. The stitched edge is actually a rectangular die from MFT. I just turned it at an angle and only cut a portion. The pig was cut using the coordinating die for the stamp set and colored with Copic markers R0000, R00, and E21. I get a giggle out of this every time I look at this card...especially since I'm using it for my son-in-law who is celebrating his birthday and recovery from surgery. I can't think of another sentiment that covers both those occasions for a man who loves his bacon! Quick post today because I've just decided that I need to start over on a story I was already half-done writing for an August 1 deadline. And that's in addition to the previously announced deadlines for the three-book series plus three promotional novellas, the first of which are due July1 and September 1. Yikes! This card combines a couple of challenges and gets me ready for Mother's Day next month. I'll be using the leftover cut out of the "mom" on a different card soon. I'm not sure how long it will be free in Design Space, so hurry over and get it while you can. Now back to the Russian Revolution and lots of gorgeous, glittery jewelry. If you'd like to see some of what's inspiring my story, you can visit my Pinterest page here. 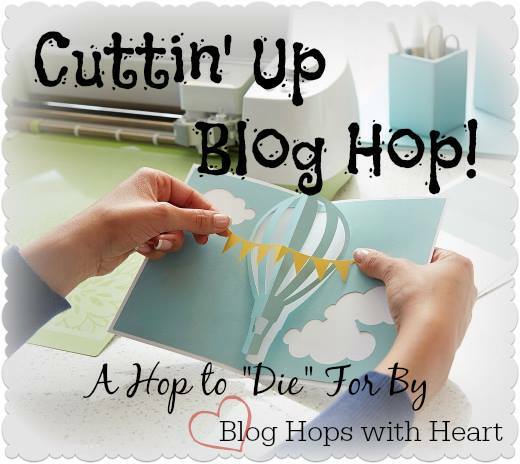 It's time for another installment of "Blog Hops with Heart." Our fearless leader, Amie Kiger, has done an amazing job of assembling talent for this group, so you want to be sure to complete the entire hop. I'll give you a link to the blogs before and after mine in a moment. I did some slicing and welding with images from Cricut Design Space free "Basic Shapes" and CTMH Artistry to create an overlay that measures 4x5.25. I cut the design four times for four different cards. This is the second card I've posted using this same overlay. If you have a Cricut Explore and/or use Cricut's online Design Space program, go to my previously posted card here for the cutting file. I use 100# cardstock which gives these delicate cuts more strength but means I need to use more color from my Copic markers for blending. It also means I adjust my Explore to cut at the depth between "cardstock" and "fabric" on the setting dial and use a German carbide blade. I colored the image before I peeled it off my cutting mat simply because it gave those fine lines extra stability. I used Copic markers R01, R20, R22, YG61, YG63, YR21, and BG0000. Although the picture doesn't show it, the blue-green color goes all the way around the outside frame. I added three or four layers of BG0000 to the corners for the shading with only one layer around the rest. The sentiment is from "Happy to be Friends" and is stamped in Whisper dye ink. Pretty simple, even though it doesn't look like it, because my Cricut and Artistry cartridge did all of the hard work. Now it's time to head to the next blog post which is Stephanie's. If you want to be different and do the hop backwards, you can head to Kelly's blog instead. If you get lost, you can always go to Amie's blog for a complete list. Sometimes I like to see how many card challenges I can meet with one card. This is one of those. The stamps are from an long-ago CTMH set called "Miss May" colored with Copic markers. Although I love the clean, graphic stamps that are the trend now, every once in a while, one of these cute images calls my name. Between owning Copics and progressing in my coloring, I can now do these old stamps justice, but I think I should have used green for the second part of the sentiment instead of more yellow. Regardless of what I did or maybe should have done instead, Miss May is a darling image, and it was fun to pull her out again after many years of languishing on the shelf. I had some fun today creating a marbled background using this week's Color My Heart Challenge: Thistle, Hollyhock, Juniper, and White Daisy along with CAS(E) this Sketch #168. To create my background, I smushed a 3x3 square acrylic block into Thistle ink. I then used a crumpled piece of plastic bag to dab water onto the block and get the ink moving. I stamped the block onto white cardstock, cleaned the block, and repeated the process with Hollyhock and Juniper ink. After carefully considering how I needed to cut my square so it would look like a rectangle and follow the sketch, I cut the angle the wrong way...so I flipped the sketch. The sentiment panel is 1"x4". I stamped the sentiment with Thistle dye ink (Happy) and White Daisy pigment ink (Anniversary). After letting the pigment ink dry, I used a scratch piece of paper to glue the bottom piece of the marbled background first, the sentiment strip next, then the top piece of marbled background. Some stitching and a crochet flower with corduroy brad center (retired CTMH accessories) finished off the top panel. The white cardstock panel is cut at 4"x5.25" and scored at the 1/4" mark all the way around. I mounted it with foam tape on the card base, then mounted the marbled panel with another layer of foam tape. Okay...time to face the music (aka, the tax man). Wish me luck! I used CTMH Artistry and Design Space Basics (free) to weld the flowers and rectangle together. Here's the file if you have Cricut Design Space. I loved this so much, I cut four at once and have been playing with different ideas. After cutting, I removed the entire image from my mat and poked out any hanging bits of paper. I then cut a square of CTMH Kaleidoscope paper into two triangles and glued them into the corners. Next, I peeled off the center of the cut out and glued it just where it overlapped with the Kaleidoscope paper. After stamping my sentiment (CTMH Happy to be Friends) in Gypsy ink and securing the ribbon with tape, I used lots...and I do mean LOTS...of foam tape. I got very close to the edges so the border and inlaid piece are secured together with the foam tape. I forgot to take a picture, but I'm telling you, the back of that top panel is almost covered with foam tape. There's a time to conserve and a time to got hog wild. This is a hog wild kind of moment. I don't know who this will go to or for what occasion which is why I used the generic sentiment. My dad's birthday is coming up soon. He's a former Texas and Colorado boy who moved to Washington State because it's where my mother lived. When I was growing up, he often talked about how difficult it was to adjust to the rain. I didn't get it until moving to Colorado and Oklahoma where the amount of unending sunshine gets a little monotonous. I thought I'd wish him "Blue Skies" since, in truth, he probably won't get them. It's a nice sentiment anyway. This card is going into this week's Freshly Made Sketches and Color My Heart challenges. The sandcastle is an old, wood-mounted image from CTMH stamped in Sapphire pigment ink and embossed with clear powder. I then watercolored using dye ink in Flaxen, Glacier, and Pomegranate by squeezing the lid into the pad and picking up color with a wet brush. Once the main image was colored, I covered it with a piece of scratch paper and flicked watered down Sapphire dye ink over the top. I used CTMH Regatta paper for both the patterned papers and the sentiment. I folded down the edges of the banner and mounted the center on foam tape to give it extra dimension. Plain Pomegranate cardstock edges both sides.